Photo by waltarrrrr via Flickr. The perils of being an early-adopter: I was recently surprised to discover that my 3 year old TAP card had expired. @blinkie Tried to load my TAP card with a day pass and the machine said it expired. @metrolosangeles since when do they expire? Each Card will expire approximately three (3) years after its date of issuance, except for Personalized Cards which will expire based on Cardholder’s period of verified eligibility. I was vaguely aware of that TAP cards had a limited lifespan, but I wasn’t thinking about that last week when I added $40 to my card only to have a turnstile alert me that my card had expired (and my added value inaccessible) a few days later. Yikes. So how do you take care of an expired card? Answer after the jump (you’re not going to like it). According to TAP representatives, the only way to fix an expired card is to replace it… by buying a new one. A new card will set you back $2 and if you had stored value or passes on your expired card you must call 1.866.TAPTOGO to have the cash or passes transferred to your new card. Not ideal, I know. That’s why I recommend checking for the expiration date of your card to avoid any surprises. How do you do that? You can register your card at taptogo.net (watch this tutorial on how to do just that) and you can find the expiration date of your card in the “My Cards” section of the website. Alternatively you can check the expiration date at a Ticket Vending Machine (“View TAP status”) or by calling 1.866.TAPTOGO. I told you a long time ago that TAP cards clearly showed an “expiration date” on the taptogo.net site. No one listened. Ha! In contrast, my Suica card for Japan that I got over ten years ago still has no expiration date and is still going strong. How on earth is Metro going to get people to use TAP when there’s so many things wrong with it? Doesn’t this run afoul of California law, specifically that about gift cards? It is illegal to charge a monthly fee against the stored value. And the renewal process is impossible. My senior TAP card was to expire June 30, so in April I called TAP to find out when I should renew. They said May 1, so, on May 6, my application was hand-carried to the Crenshaw office – who said it was way too early, so they would hold it until June 1. On June 25, I checked, and there was no application on file – had to re-apply, and am still waiting for the new card (using a temp card for now). Worse, the TAP headquarters thought my card didn’t expire ’til next year, so they auto-purchased a July pass, and I’m still waiting for the refund check. For Regular TAP card users, to buy a new one is relatively not a big deal, because we can get one online, or even get one instantly at customer center. My major concern is about my parents’ Senior TAP cards. Since Metro is supposed to have data of all the personalized TAP cards users on file, will Metro be kind enough to send a new one to the user’s address on file before the existing Senior TAP card is scheduled to expire? Or do I need to help my parents submit a new application all over again? I agree with you Fukuzawaさん. It is a smart chip technology. Why does a TAP card need to expire in the first place? Just another example of Metro’s silly customer non-service policies; even the money they make in new card sales will be eaten up by customer complaint time. As a senior, I had an additional problem because I had to file a new application, submit a new photo, and wait in line downtown to turn it all in. Moreover, as far as I can see, Metro continues to have no interest in solving existing TAP problems (e.g. instituting a cap on daily fares to equal a day pass, inability to buy TAP cards on buses). As Y Fukuzawa noted in the above comment, other countries seem to be handle these issues easily while Metro goes blithely along with its seemingly uncaring attitude. My Oyster card from London did have an expiration date even though they are both made from Cubic has a ten year or so expiration date. The manager in charge of Metro’s TAP program should be held accountable and fired. So why do they expire? Is there any logical rationale? It definitely scares off the casual Metro user, like me, who only uses the system one or two times a month. Why buy a TAP when the $2 fee is a decent percentage of my total fares paid, especially if it can only be spread out over three years. Compare this to paper BART tickets that have stored value, don’t cost a premium, and can still be used when you find them at the bottom of a drawer fifteen years later. The technology is only 40 years old. Why is there an expiration date? Is there something in the card that will go bad, like cheese? Are there only so many unique serial numbers, such that it’s necessary to expire old cards in order to re-use their “digital signature”? Or, are “we” the taxpayer-owners of Metro just letting the outsourced company that runs TAP extort us for $2/card after an arbitrary number of months? And who says anyone “agreed” (willingly, knowingly, or otherwise) to any “terms”? You buy a TAP card at a vending machine and its ready for use. It’s not like you have the ability (or time– can you just imagine the line of angry commuters??) to read and agree to an iTunes-like Terms of Service legal thesis at the ticket machine. I love the TAP card and I think it holds a lot of potential, but it makes no sense for it to have an expiration date. I hope the next generation of TAP cards ditches this idea. Sorry for the double post, but this also seems to violate the California Gift Card Law, which prohibits gift cards from expiring and prohibits dormancy fees. Technically you could argue that these aren’t really “gift cards”, but the purpose is the same: spending money up front to put a cash value on a card. The only exception in state law concerns prepaid calling cards. This is rather baffling CUBIC makes the Clipper Card in the SF Bay Area and those cards don’t have an expiration date. Metro really needs to hire some new Software Engineers because its becoming increasingly evident that perhaps the current team is not up to par. I thought TAP was supposed to replace paper passes. Making people buy brand new cards this way … is not very eco-friendly after all. I never understood why you have to pay for the damned card in the first place. METRO gets your money UP FRONT (upon which they can collect interest) and like the postage stamps the fare is redeemed as you use it. Jason L. – see my comment above – yes, they need to fill out new applications with new pictures – the expiration date is on the front of the card. I believe the TAP card can be considered as a gift card in a way that you have the ability to put cash value on the card and use it on a wide variety of “places,” i.e.Metro, Culver City Bus, Santa Clarita Valley Transit, etc. This is nothing more different than buying and topping off any-cash value AMEX gift card from Ralphs and being able to use them anywhere AMEX is accepted. I told ya’ Metro’s gonna get a hard time once those TAP cards start expiring. I could understand paying $2 as a DEPOSIT (i.e. JR makes you pay a 500 yen deposit for the card, you get the 500 yen back if you return the Suica card, same with the Delhi Metro Card, etc. ), but the idea of making people pay $2 over and over again by imposing a ludicrous expiration date (which no other place implements on a smart card!) is yet another example of how Metro really has no idea how to make public transit work. Isn’t it sad how LA Metro gets things wrong when even the Delhi Metro gets it right? I switched to a “Pre-Paid” debit card, which gets loaded with a monthly MTA pass each month. It DOES have an expiration date on it (01/2014!). Hopefully, I will get a new one sent to me before then! Yes, but in that case, state law is clear that the expiration date must appear on the front of the card. California Driver License expires approximately every five years, depending on your driving record; at a replacement cost of $20.00. Buses and trains need maintenance; employees need compensation for their services – $2.00 every three years is not a major inconvenience, is it? You don’t load up your drivers license with funds and then use it to pay to drive the car. When this happens to someone with influence and money, Metro and Cubic should expect a lawsuit. Metro better hope that somewhere there is proof that a Spanish language flier explaining the expiration date was distributed to riders offline at some point in time. Not sure how else the many Spanish speaking riders could consent to the terms and conditions otherwise. The Drivers Licnese expiratation date isn’t really a fair comparison to the TAP card expiration. The Drivers License is used as a form of identification, my TAP card does not have my photo or any personal ID information on it. A person’s appearance can change in five years. The DL is a permit giving permission to operate a vehicle, the frequent maintenance of the driving record and updating of information is important. The DL fees pay for more than just the issuance of a card. From a technical standpoint, there’s no reason why the TAP has to expire in 3 years, 5 years or even 10 years. As long as the card itself remains in good condition, the three year limit is completely artificial. TAP cards should never expire, unless the TAP program itself ends. I understand it’s in the agreement now, but this is very rider-unfriendly, IMHO. If you’re talking about the TAP ReadyCARD, be ware of monthly fees on the debit portion of that card. The moment you use that card as a debit card, you are dinged a $4.95 monthly maintenance fee amongst all the other fees attached to them. The cards have tiny batteries in them, so they do expire. However the batteries last longer than three years. CharlieCards in Boston are similar. However they are FREE — in fact, the MBTA leaves them sitting on top of payment machines so that you can start using one right away. Oh, and you get a discount for using it (subway is 30 cents cheaper, bus is 25 cents cheaper). 1) If I fly into LAX and want to get a TAP card, I have to go to Union Station ($7) and open an account in person. I can’t simply pay $2 to a vending machine in Aviation Station (or a vending machine in each airport terminal, a la Boston). 2) Why is a weekly pass based only on a Sun-to-Sat week? If I come to town for the weekend, I’m better off buying a daily pass each day ($6/day) or I’d pay $20 Friday and another $20 Sunday. 3) I can’t get a daily pass on a bus. If I’m not at a subway station when I start my day’s travels, I have to pay for a trip BEFORE I can get somewhere that sells day passes. They clearly haven’t studied how people from transit-centric cities use transit. They’re slowly getting the idea that the second-largest city in America shouldn’t assume every visitor will rent a car. However they’re still acting like SEPTA (Philly’s crummy transit agency) about far implementation. Think capitalism, not bureaucracy! One bit of good news for you: the Metro board approved rolling weekly and monthly passes in May. Sales are scheduled to begin August 1st. That’s my tweet. I went to the Metro desk at Union Station, assuming I could un-expire my TAP card. The nice customer service rep told me no, I have to buy a new one. Okay, I said, and pulled out my wallet. She refused to sell me one without a day pass. I already HAD a day pass, because I had to buy a paper one, since the ticket machine wouldn’t take my TAP card. All I wanted was the two-dollar card Metro insisted I had to buy — and the rep WOULD NOT SELL IT TO ME without also charging me for a pass I didn’t need. She said there were rail stations I could buy a card at, but could not name any. I checked the Tap site and all it lists is gas stations and skeezy check cashing places. Honestly, if you’re going to charge me $2 every three years for a card, you could at least sell one to me at UNION STATION of all places. I sent thesource pictures on what a real contactless card can do; the JR Suica Card. Hopefully they’ll make an article out of it so Metro realizes how far they are behind from the rest of the world. The plus on this card is not only cheaper fares, it has a price cap at the cost of daily pass. London has a zone fare structure and peak/off-peak price, LA’s one price structure should be even easier. The use of card is not limited to commute, it is almost like a debit card that you can use from newspaper stand to bakery or wet market. Both cards are prepaid and user can top up the value, and a fully-refundable deposit is required. The interest generated can easily cover the operational cost. Besides, by using it for non-commute purpose, the card issuing authority can charge a percentage of the transaction just like credit or debit card. While LA doesn’t have as many metro stations as London or Hong Kong to be top up outlets, if they can get banks to enable that functions in their ATMs or online banking, or setting up machines in gas stations, it should be able to build a large network, and make the transit system more efficient, plus the extra fund. @Venetia: True, $2 to get a new card every 3 years is not a major inconvenience for Regular TAP users, but it really is a major inconvenience for Senior/Disables/Student TAP users because they literally have to pray that their applications do get processed. Please refer to the comments by “Lincoln” earlier in this thread. I recently bought a tap card. After learning this… I’m going to throw it away. You can pry my EZ Transit pass out of my cold dead hands! This is absolutely preposterous metro. I have told my friends, family members and coworkers how wonderful the TAP program is, and now we find out about this? You need to fix this. This is unacceptable. Talk about one step forward, two steps back. Driver’s licenses are not the same thing as fare cards, as driver’s licenses can be used to prove identity and used in combination with other documents to prove work eligibility. A TAP card could never ever do this. I would not be abject to an expiration were Metro to make it relatively brainless to get a new one. The issue is if someone was in a hurry to use the train/bus only to find their TAP card had expired, especially if this was not a daily user, they would be EXTREMELY unlikely to use public transit again in the future as this just made them late and likely ruined their day. Additionally, if you’re trying to add fare to an expired TAP card, it would make a great deal of sense if the ticket dispenser informed you it was expired, charged an extra two dollars and printed you a new TAP card with the cash purse restored on your card. Anything besides this is completely unacceptable and a waste of everyone’s time. The harder you make public transit to use, the less likely anyone is to use it. Especially when there is NO GOOD REASON when it has to be complicated at all. Fix this metro. I am an infrequent rider (but in the past I rode often on a student card). This makes me far less likely to get a card. Even from a business perspective, charging $2 for TAP WITH AN EXPIRATION DATE clearly has no business sense at all. Anyone who worked in the real world would see that the $2 revenue from expiring TAP cards will clearly be eaten up by the cost and wasted time in labor in re-issuing new cards. 1. Eliminate the expiration date. 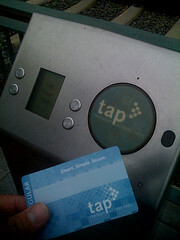 The only expiration of TAP card should be normal wear and tear, and should not be subject to any set date that is software programmed to expire. Three years throw away plastic cards and buy another one for $2 idea is hardly cost-efficient and not environmentally friendly. 2. The $2 for the TAP card should be a DEPOSIT, not a fee. The $2 has to be returned to the TAP user if he/she decides he/she does not want it anymore. This helps tourists to Los Angeles paying $2 deposit for a TAP card at LAX to get back the $2 deposit and any remaining funds when he/she leaves from LAX. The TAP card can be used again for another tourist. 3. Provide real incentives for transit riders to actually start using TAP as a cash-purse loadable card. London Oyster, Seoul T-Money, Boston CharlieCard, and even the paper NY MetroCard offers discounted fares or extra value for using a system that speeds up the boarding process over paying with bills and coins. 4. Daily cap system. It has been addressed before and people keep asking it again. What’s taking so long? As someone that was forced into using a TAP card (went to Union Station one month to buy my pass and found I couldn’t without getting a TAP card), I was handed a brochure telling me how awesome TAP was and generally how it worked, but where was I supposed to see and access the TAP “agreement” during that transaction? Wow, I thought I was the only one who experienced the ‘expiration’ of my TAP. It would have been nice (and I would highly recommend) the TAP agency maybe e-mail the card holders at least a month in advance to alert them to prevent these surprises or put an expiration date ON the TAP card. I would just like to draw attention to the Metro bus lines lack of honoring good students. Since it is the law that k-12th grade is mandatory for children and parents must work even if they are a single parent and in need of financial assistance, then children that show excellent attendance at there schools and also good grades should be issued a free bus pass thru there schools courtesy of MTA. Remember our future is our children, and cost of riding the bus sometimes of the year or month is extremely burdemsome to a single parent or families that are proverity level. I checked and no agency I contacted did not officer assitance in bus passes to students. This is a shame all adults should voice there opinions to MTA and the School board to partership to help the success of good students with good grades and or course attendance with this reward. TAP has the potential to be great, but it needs a renewal now. Everything about TAP has become complicated. No wonder Metrolink is reluctant to use it. Metrolink should join (without loosing transfers to Metro) and Metro needs to REDO the Reduced Fare card process, yesterday. The DMV is simpler, the DMV! Put the cards in all machines. Get the info onto the machines to let infrequent people know about TAP and why it will be better to get it for the wallet value or day pass. Sell TAP cards in all machines without having to buy a pass or give them for FREE. Actually…Metro….Just COPY Oyster card in London, or Suica in Japan. No? Ok then just copy Clipper in the Bay area! they all use the same technology there is no reason the TAP system should be this messed up. My first use of the TAP card was on a bus when LA Metro drivers were giving them away if one bought a day-pass. Where/when was I informed of the TAP Cardholder agreement in order to give my consent? I don’t recall agreeing to any expiration date or other terms of service when I bought and loaded my TAP card at one of the vending machines at a subway station. Incidentally, a lot of Metro bus drivers still don’t know what to do when you use a TAP with stored value on an express line with zones. I got a free ride because of that today, but still. My Tap also expired approximately after 3 yrs. I never saw a Terms of Service when I had to buy a New Tap card for $2. I don’t see how Metro is still struggling for $, but they must be to nickel and dime you into submission. Ronny Rueda, Y Fukuzawa: Actually, adult Clipper cards do have an expiration date — ones given out last year are valid until some time in 2030. The people with the most to complain about are senior citizens, since two of the participating agencies (AC Transit and VTA) refuse to allow senior monthly passes to be loaded onto Senior Clipper Cards, requiring anyone who wants one to obtain an RTC Discount Card (which has a $3 issuance fee and not more than three years of validity). Note that if you have a reduced-fare TAP card, that entitles you receive one courtesy RTC Discount Card good for the same term (but not more than three years). I just checked my two picture TAP cards and they don’t expire until 2013. There is no money in or on either as I still use the paper Senior EZ Pass until I hear from you or Matt Raymond as to any changes. I showed my cards (including the one whose photo completely faded)to Matt Raymond at a METRO Citizens Advisory Council meeting some months ago and he explained the tech problem with the photo cards which I originally handled through Jack Gabig when he was at METRO (he is now at Gardena Bus Lines as the Director of Gardena Bus Lines). Incidentally, Jack spoke at our last Southern California Transit Advocates Meeting and was very well received. The newer ones have the expiration date printed on the front just under your name. Mine says nothing about 3 yrs.But when I bought a 1 day pass on board Thurs, it didn’t go thru.On the lower left on the back, it says AK-08-11, which presumably is the expiration date.